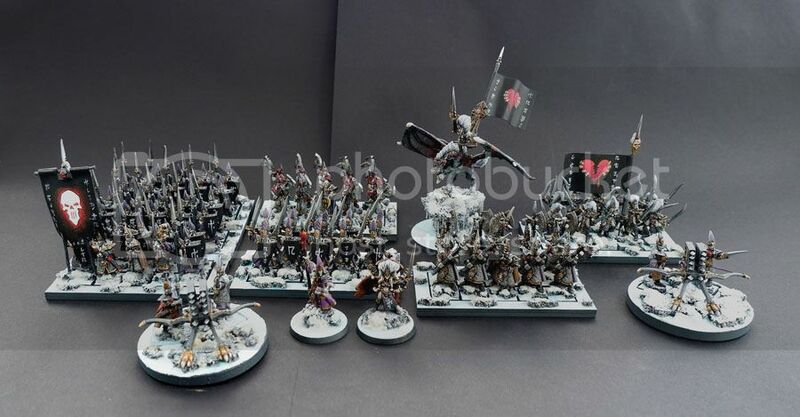 I had the same dilemma about painting Malekith on foot! 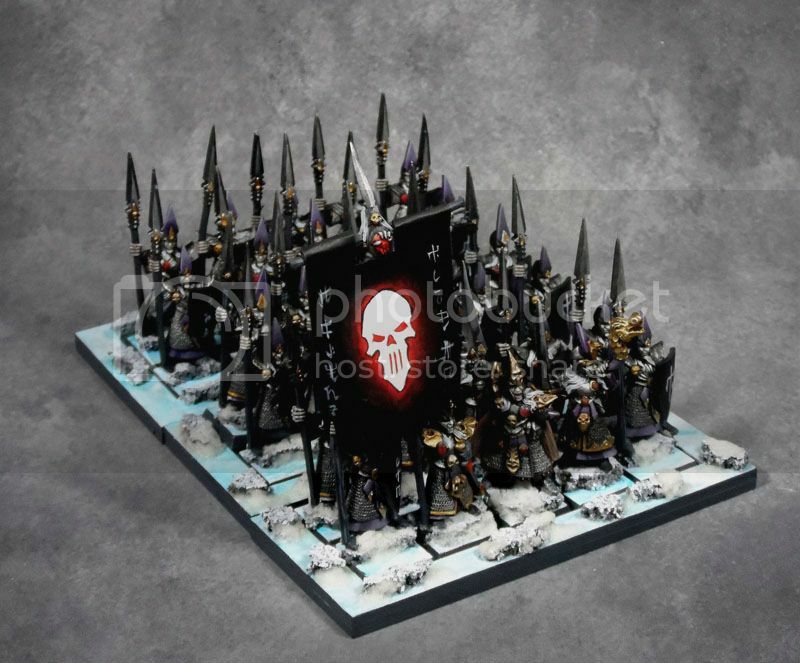 Yes good to see some paint on them - the red cape really makes the model pop! Do you have a Mally on foot? I would love to know how many of them were originally cast. I have made it a mission of mine to collect as many of those unreleased models as I can - but they are difficult and expensive to come by. 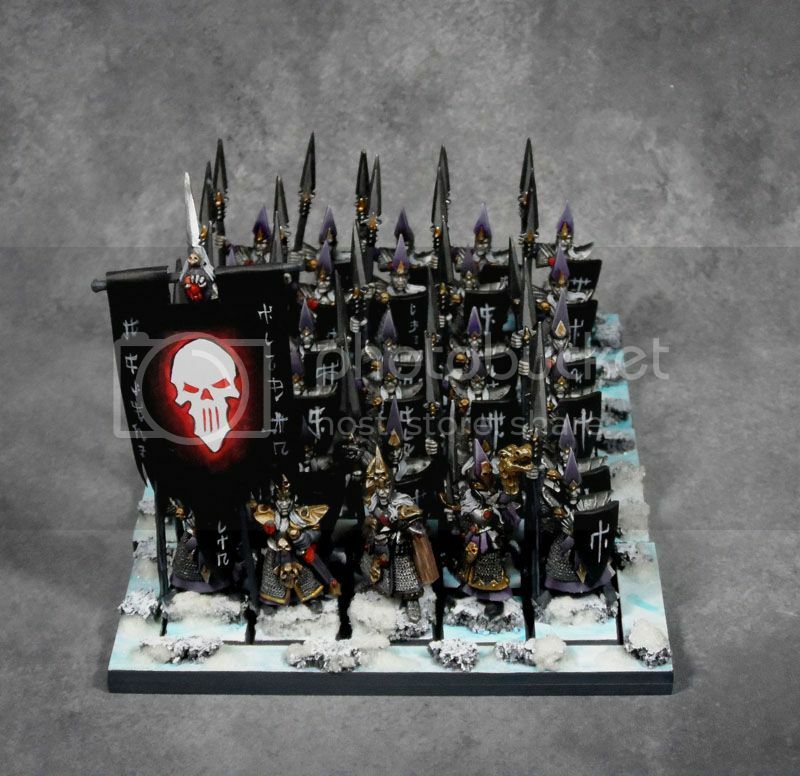 My next purchase I have been looking for is a rare assassin and there are a couple of witch elves that are also quite rare. 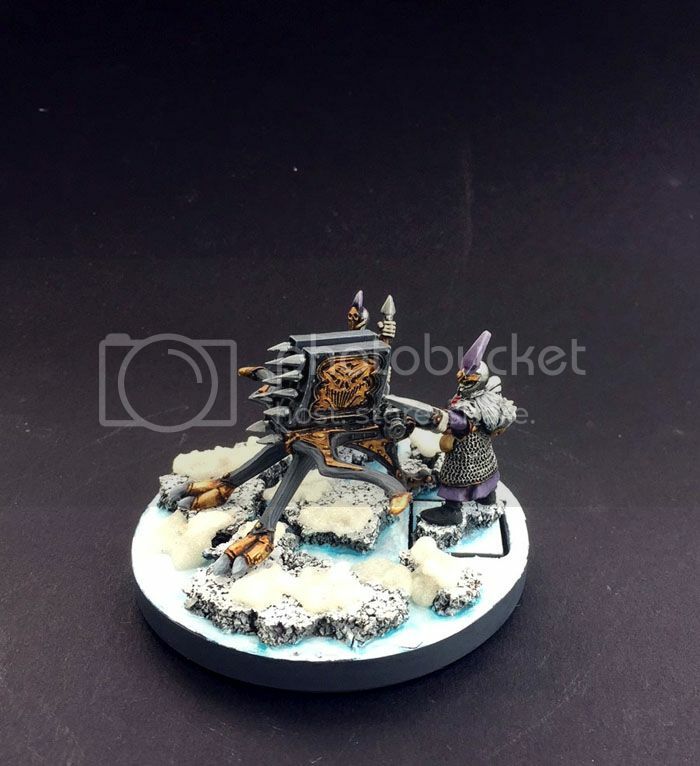 I'm glad you have that Hag in your army - it rounds the old school theme off nicely. I was lucky enough to pick one up years ago. I don't there are many of them about. I knew you had one obviously but I only know of 2 others. I'm still after the witch elves too but as you say the prices these days are crazy. Amazing work and progress. 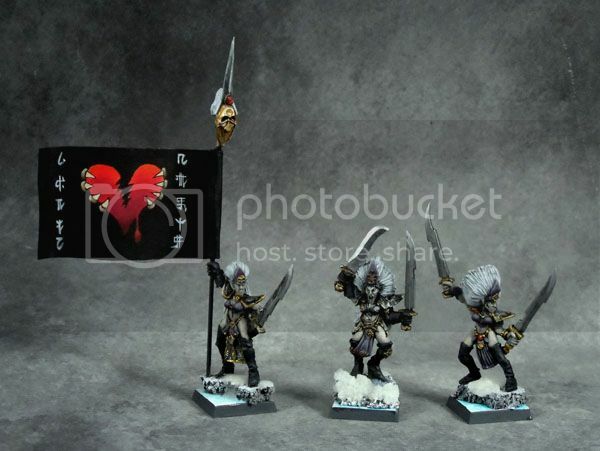 This is the best retro Dark Elf I think I have ever seen, as I normally did not liked the models, but wow! 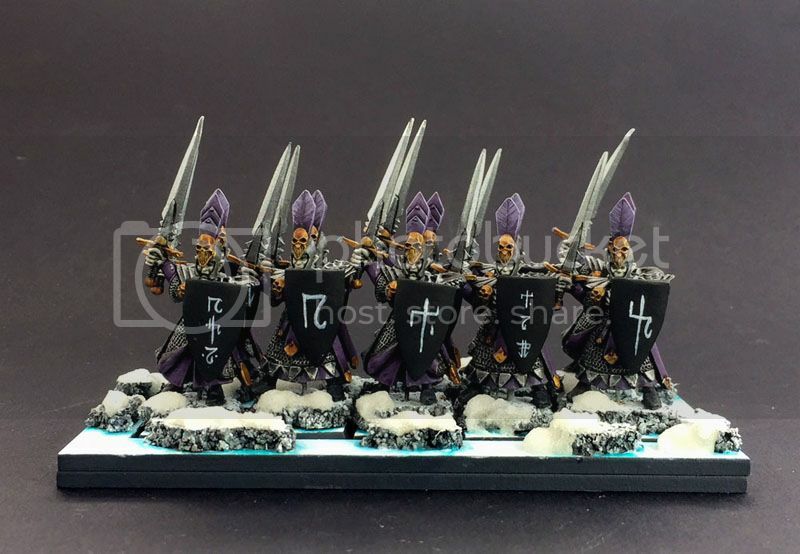 Also best snow bases I have seen so far, they really do their job in giving that icy cold feeling. Normally I find the contrast too high, but you found the perfect look! Apologies for the delay but I was distracted by other games for a whils. Here's a preview of the next unit I'm working on. Progress has been retty good so far so I'm hoping to finish these in the next couple of days. 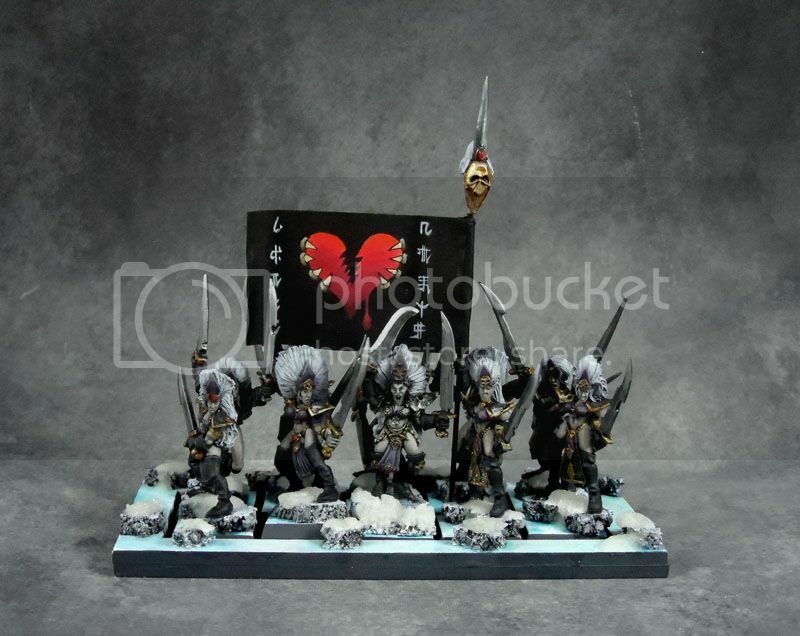 I have a pile of these to paint myself, I really love the old sculpts, but did not like the swords they hold (they look a bit chunky) I ended up lopping them all off and pinning them with something smaller. They look nice and welcome back! Cheers. I know what you mean about the chunky swords and I think that's what was one of the reasons I put them off. Here's the finished unit, quite pleased with them. 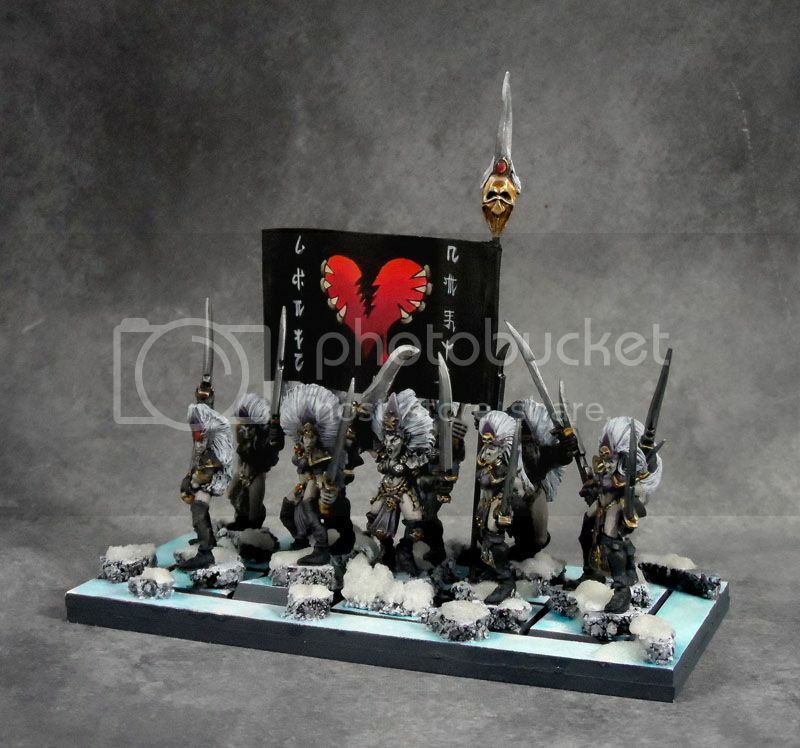 I really need to think about banners for the next unit though as I've used the ripped heart twice now. 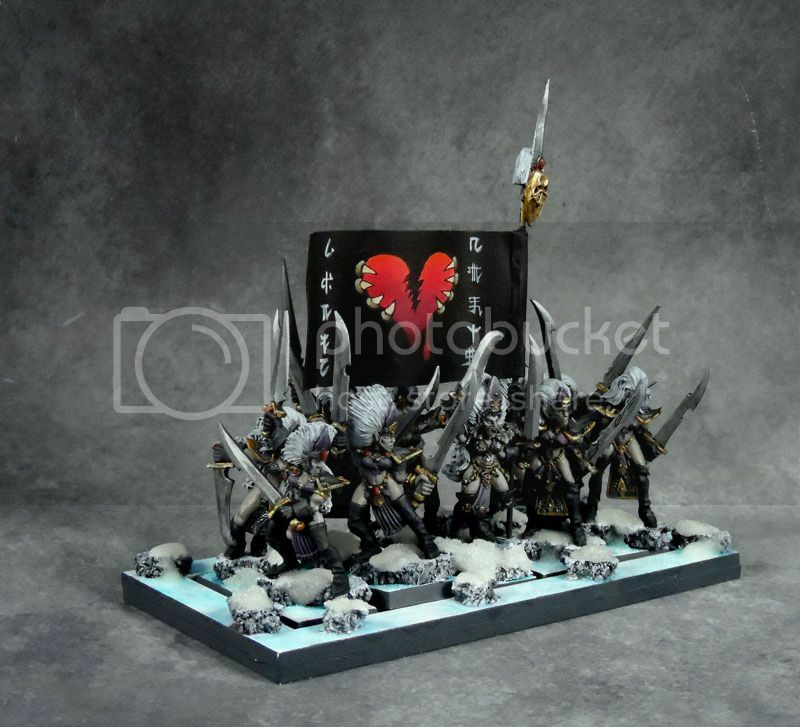 Next up will probably be another 10 Witch Elves or 10 Spearmen before moving on to Rakarth riding a black dragon. Last edited by With hatred ... on Sun Oct 14, 2018 4:14 pm, edited 1 time in total. 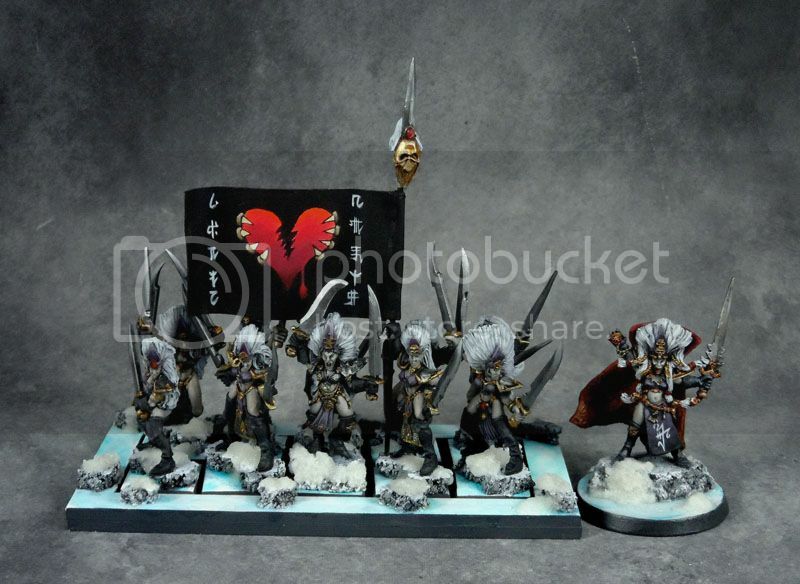 Nice looking unit - those old school witch elves have a lot of charm. I also like what you have done with the swords now that I can see them closer - they look much better than the originals. 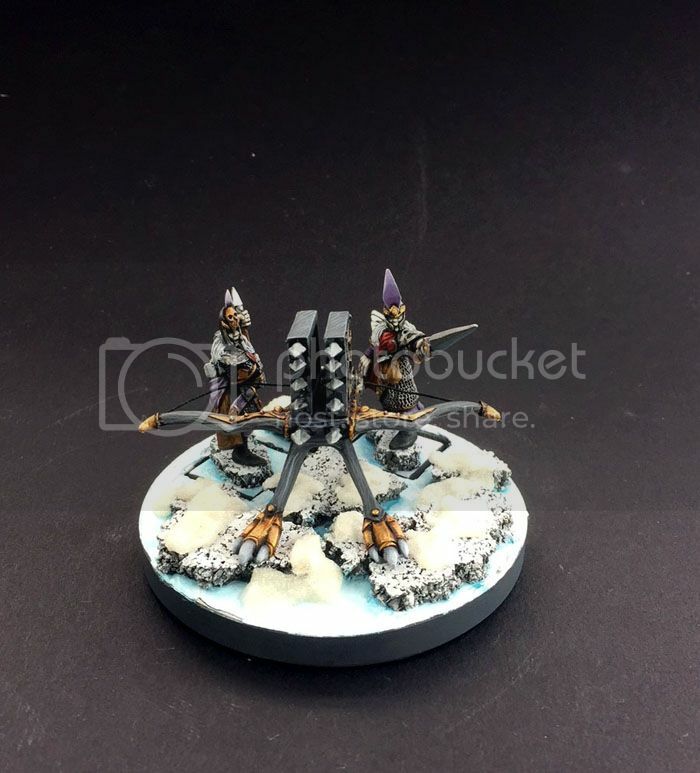 My only criticism is that the snow bases look a bit flat. Those rocks look like they have just been dropped on - can put some frozen foliage on them around the rocks to break up the transition a bit? I have been thinking of adding some of the old GW dead grass, straw coloured stuff. perhaps that would help. Some blob snow would be good - they do a static grass that looks like snow. Your lucky they hero in the last pick on the right is quite a rare model - it was unreleased! 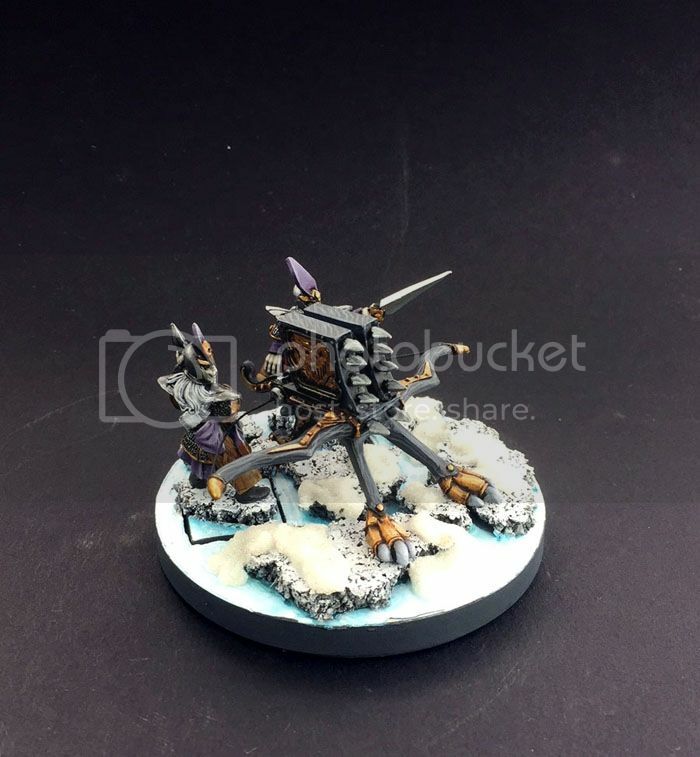 Amazing unit, very neat and bases great as always! I do not agree about your red, I think it looks great. Yeah, I was very lucky to come across that one. 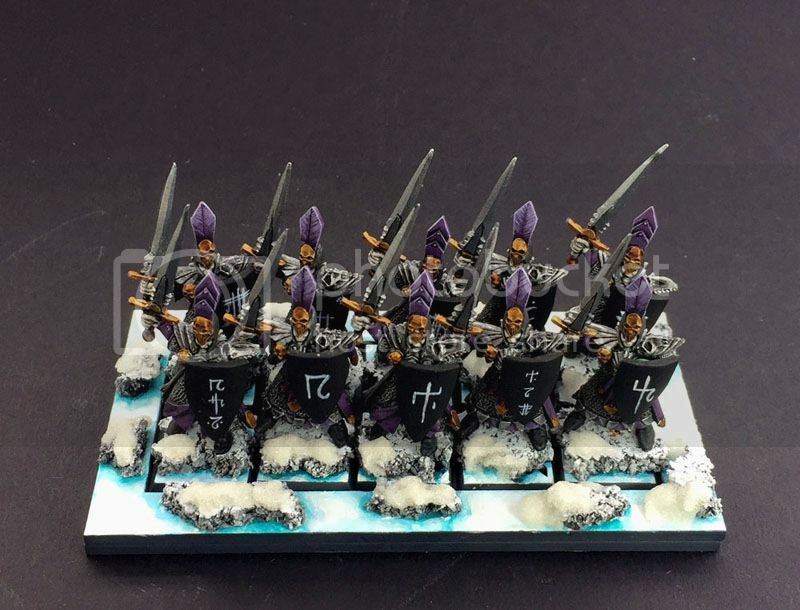 I've boosted the Spearmen regiment to 30. Last edited by With hatred ... on Sun Oct 14, 2018 4:19 pm, edited 1 time in total. Wow! Really striking and coldly disciplined unit. Nice effect on the glowing skull. Yes nice looking unit - you knocked that out fairly quickly! I already had 20 of them done, it was my first unit, so just a case of adding another 9 and a musician. Not sure what's coming next? Maybe a cauldron? Since the last post I've added some more fire power and warriors.